There are a few requirements around exit signs. Many different types of buildings are required to have illuminated exit signs. There are specific guidelines about the size and weight of the fonts on the exit signs, as well as their positioning and the brightness of the bulbs. In addition, many buildings are required to have directional or exit signs provided at every exit door, at the intersection of corridors, at exits and ramps, and other places where it is deemed necessary to provide occupants with knowledge about the various means of egress. For more information, check out the California Code here. In the state of California, every building that has an elevator must have a sign posted on every landing that reads “In case of fire use stairway for exit. Do not use elevator.” As with the exit signage, there are specific guidelines about the size of the lettering on these signs. 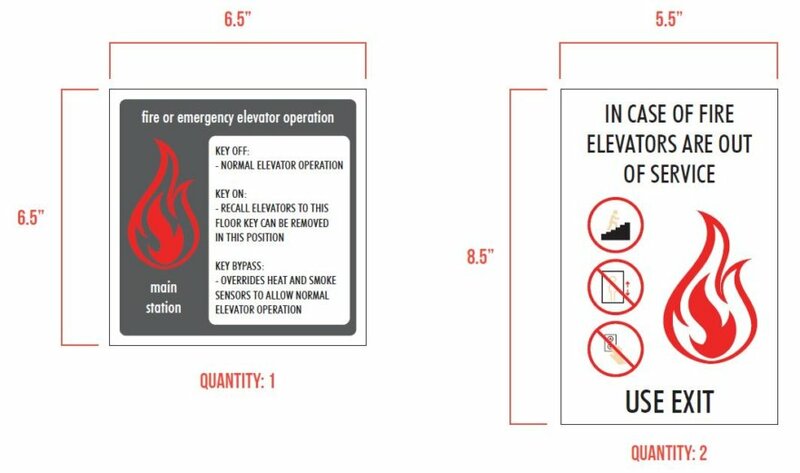 There are also additional regulations about signage requirements for the inside of elevators, with instructions for what to do in the event of an emergency. For more information, read the California Code here. The state of California has strict laws about smoking in places of employment. In order to properly enforce this procedure, there are requirements for posting signage appropriately. The California Code requires that a sign stating “No smoking” must be placed at the entrance of buildings where smoking is prohibited, and that a sign stating “Smoking is prohibited except in designated areas” in buildings that have specific smoking zones. For more information, read the California Code here. Some large buildings require signage with emergency evacuation instructions for each floor that can easily be seen upon entering that level of the building. As with the other types of emergency signage, there are requirements about the minimum lettering size, as well as specific instructions about the types of fonts to be used on the signs, and the contrast requirements for the sign production. For information, read the California Code here. Can Safety Signs Still Meet Your Building Aesthetic? Safety is the primary focus and concern with emergency and safety signage, but there are still ways to follow the guidelines to ensure safety of your tenants and guests while keeping look and feel that you want for your building. At Starfish Signs, we provide custom and compliant signage solutions for our clients. Because we don’t just churn out generic signs, you can count on us to make sure your signs look the way you want them to while still following the law. The signs outlined above are just a handful of the most common signage requirements for buildings in California, but different types of buildings have numerous other emergency and safety signage requirements outlined by California Code. Here at Starfish Signs, we are experts on signage laws for all types of businesses and publicly accessed buildings and spaces. Contact us today for information on new signage, to confirm that your building is up to code, or to update and improve the look of your building.